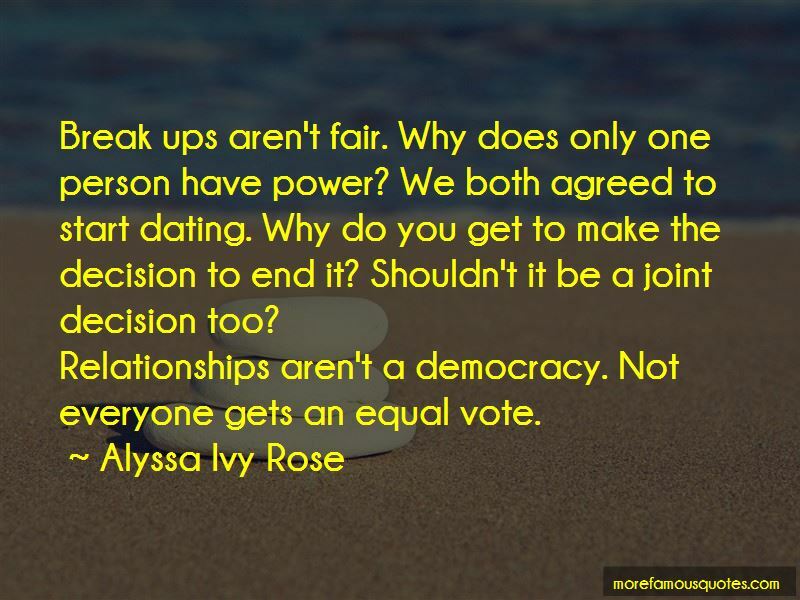 Enjoy the top 1 famous quotes, sayings and quotations by Alyssa Ivy Rose. “Break ups arent fair. Why does only one person have power? We both agreed to start dating. Why do you get to make the decision to end it? Shouldnt it be a joint decision too? “Break ups aren't fair. Why does only one person have power? We both agreed to start dating. Why do you get to make the decision to end it? Shouldn't it be a joint decision too? Want to see more pictures of Alyssa Ivy Rose quotes? Click on image of Alyssa Ivy Rose quotes to view full size.